The best part of dining at a Mexican restaurant is that beautiful bowl of freshly made salsa and thin and crispy tortilla chips. I just love it! I always wondered how they made such delicious salsa. After experimenting I knew it wasn't made with fresh tomatoes, but I also knew that it wasn't a thick and cooked salsa like many jarred ones. The secret is....CANNED TOMATOES! They are just cooked enough without becoming like jarred sauce and they give a great texture to the salsa. 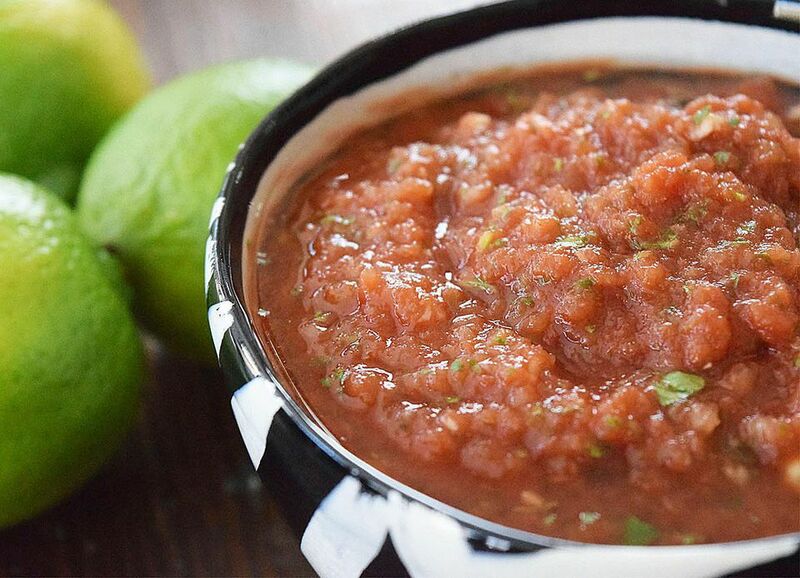 This salsa is sooo easy to make too! Just add the tomatoes, cilantro, salt, lime juice, garlic, and onion into a food processor or blender and blend away! I like to let it sit in the refrigerator for at least an hour so the flavors can blend together. You can keep it in the fridge for up to two weeks! Impress all of your friends by bringing this super easy salsa to a party. Or just serve it to your hungry family! Serve this salsa up with chips, or top on scrambled eggs, or mix it into breakfast burritos! Place all of the ingredients into a blender or food processor. Pulse until the salsa is finely purreed. If you prefer it chunkier, just pulse for less time. Just be sure the onions and garlic are fully chopped! Place the completed salsa in an airtight container and store in the refrigerator. The salsa can be served right away, but it tastes best if it sits for at least one hour. IT will keep in the refrigerator for 2 weeks!